Scythe shows off Kodati, a very compact 34mm high top-flow processor cooler designed for Mini-ITX systems. Kodati features a copper base, two heatpipes and an aluminium fin array cooled by a 80mm PWM fan that delivers up to 24.82CFM at a noise level of 32.5dBA. 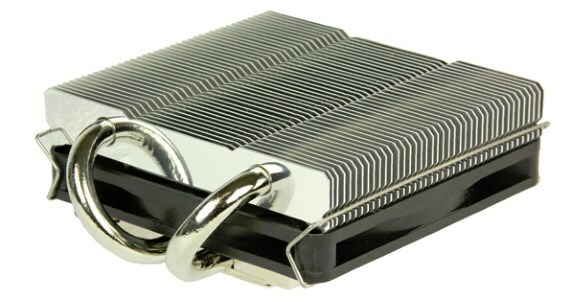 The cooler measures 82.5mm x 95mm x 34mm and weighs a mere 180g. The MSRP is 18EUR (excl. VAT). The evolving PC market moves towards yet smaller and faster Computer systems. Scythe reacts to the trend and offers its most compact Top-Flow CPU Cooler, which is focusing on small PCs and Mini-ITX based chassis. Kodati supports the latest platforms of both AMD® and Intel®. Scythe introduces the simplistic E.I.S mounting system with the Kodati, which allows fast mounting without the need for a backplate. The CPU cooler is amazingly compact with the dimensions of 82,5 x 95 x 34 mm (3.25 x 3.74 x 1.34 inch) and low weight of mere 180 grams (6.35 oz). Thanks to its height of only 34 millimeters and the fan being mounted between the heatsink and the baseplate, it is possible to use the Kodati even in really slim chassis where other heatsinks won’t fit. CPU-Heat is being passed from the copper-baseplate to the aluminum fin-structure using two 6 mm copper-heatpipes. Both the heatpipes and the baseplate have been nickel-plated. Scythe supplies the Kodati CPU cooler with a preinstalled Slip Stream Slim 80 PWM fan. The 80-millimeter fan can be controlled by the motherboard, thanks to the PWM-function, in the range from 800 and 3.300 RPM. Hence allows the fan to move between 6,0 and 24,82 cubic feet per minute (10,2 ~ 42,2m³/h) at a low noise level from 8,2 to 32,5 dBA. Compatibility to a big variety of sockets has always been a strong point of Scythe CPU Coolers. The new Kodati supports the Intel® sockets LGA775, LGA1150, LGA1155, LGA1156 and LGA1366 as well as AMD® sockets AM2, AM2+, AM3, AM3+, FM1, FM2 and FM2+. 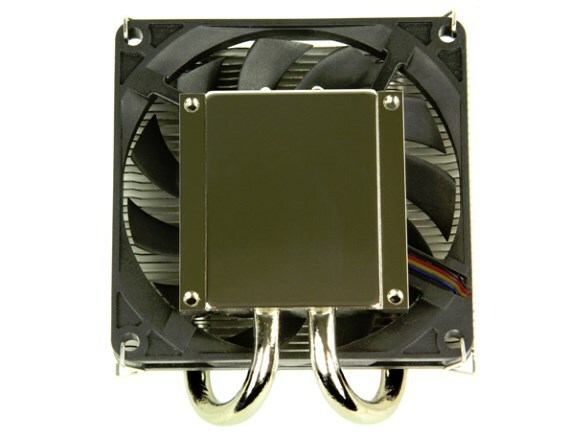 Scythe suggests a maximum TDP of 65 watts for the Kodato CPU Cooler. In case of well-cooled PC case environments, CPUs with a maximum TDP of 88 Watt can be cooled as well. The new „Easy Installation with Screw“ mounting system has been developed especially for the Kodati, to allow easy mounting without the need of a backplate. All required mounting clips, as well as the user manual and thermal grease are supplied in the Kodati package.